Cats are obligate carnivores, so they usually like to stick to eating meat. 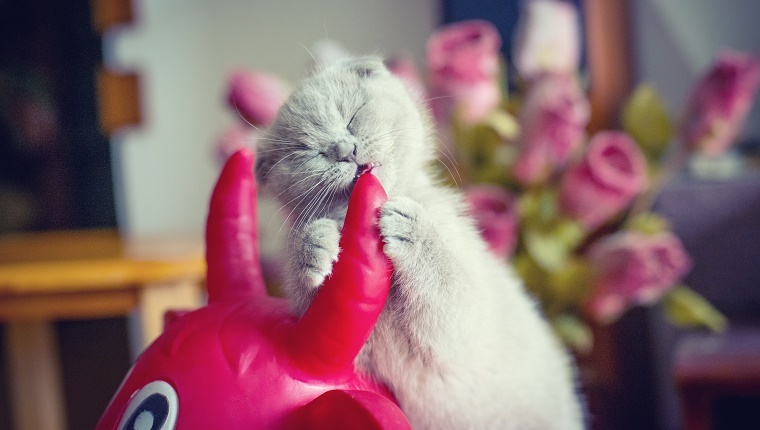 But sometimes cats start eating things that aren’t food at all. You may have noticed that your cat is starting to eat houseplants, things made of wool, paper, rubber bands, or even plastic. This urge to eat items that are not food is called Feline pica. While chewing and sucking on certain fabrics are common behaviors in cats, actually eating nonfood items is not. Here’s what you should know about pica in cats, and why some cats might eat plastic. Which Cats Are Likely To Develop Pica? Certain cat breeds are actually genetically predisposed to developing pica. Oriental cats, Siamese cats, and Birman cats all seem to be more likely to start sucking on wool, which can lead to chewing and eating. 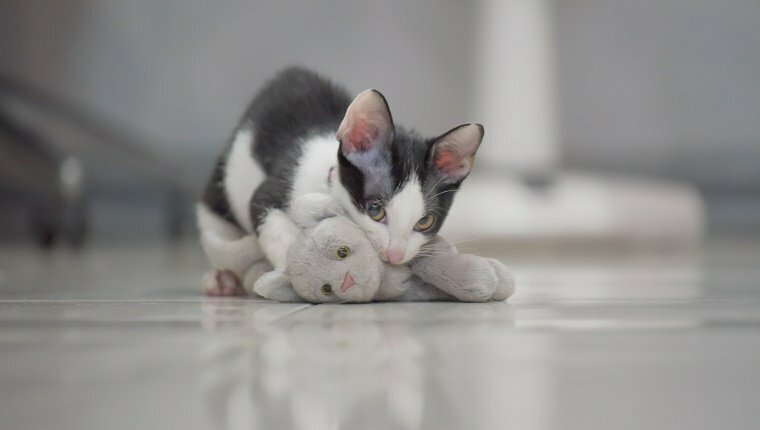 Additionally, cats that were weaned too early in life sometimes start to nurse on fuzzy items like wool or stuffed animals. Sucking or nursing might not lead to full-blown eating of materials like plastic, but it is a precursor. Though pica tends to develop in younger cats, it can appear in older cats, too. Pica is still a bit of a mystery to most veterinarians, and it doesn’t exactly have one specific cause. There are, however, many possible reasons a cat might start to eat things that aren’t food. Deficiencies in the diet can cause cats to start eating strange things. Cats might start to eat their own kitty litter if they are anemic. Inadequate amounts of fat or fiber in the diet may also lead to cats seeking nutrients from unusual sources. 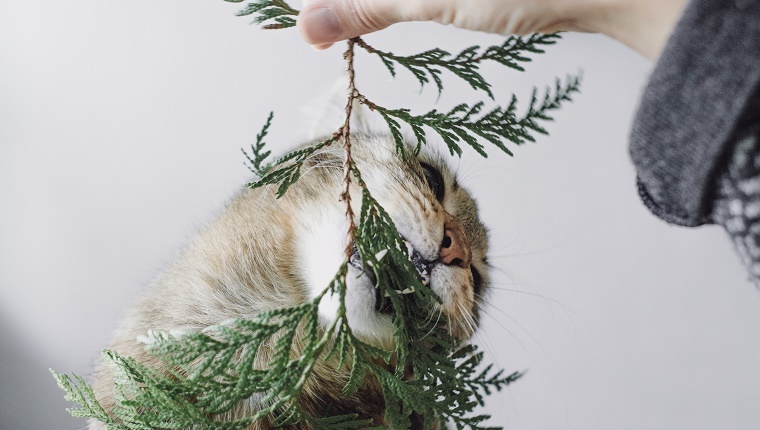 Some cats might nibble grass, and that’s a fairly normal behavior, but cats who start eating too much plant matter or chew on houseplants may also be trying to compensate for a lack of nutrients in their diet. Anxiety or boredom can also cause a cat to eat nonfood items. It can be an attention-seeking behavior, especially if your cat notices that you are reacting strongly to it. Chewing and eating may also be a comforting thing to do that reduces stress. 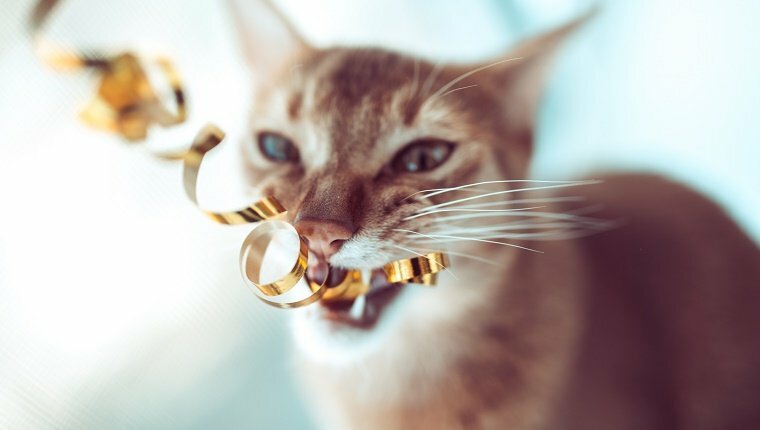 If a cat is just bored and not getting enough mental or physical stimulation, they may just chew on stuff because it’s something to do. Medical issues can result in a cat developing pica. Leukemia and feline immunodeficiency virus (FIV) are associated with eating nonfood items, as well as diabetes. Certain brain disorders like brain tumors may also cause this behavior, and pica can be the result of compulsive disorders. If a cat is doing some light sucking or nursing on fuzzy items like blankets or stuffed animals, it’s not usually a problem. This behavior is actually fairly common. It’s also somewhat common for cats to chew on plastic bags that can contain gelatin. A cat may also occasionally chew on grass without issues, so long as that grass hasn’t been treated with fertilizers or weed killers. The problem starts to arise when cats begin ingesting nonfood items or chewing dangerous objects. When a cat starts to swallow wool, plastic, or any indigestible material, an intestinal blockage can occur. Blockages can cause a lot of problems and can even be deadly if they aren’t treated. Cats who eat grass may progress to eating outdoor plants, which can have weed killers or pesticides on them. If your cat starts chewing your houseplants, make sure you are aware of which plants are poisonous to cats. Daffodils, azaleas, geraniums, and tomato plants are all toxic to cats, as well as many other plant varieties. 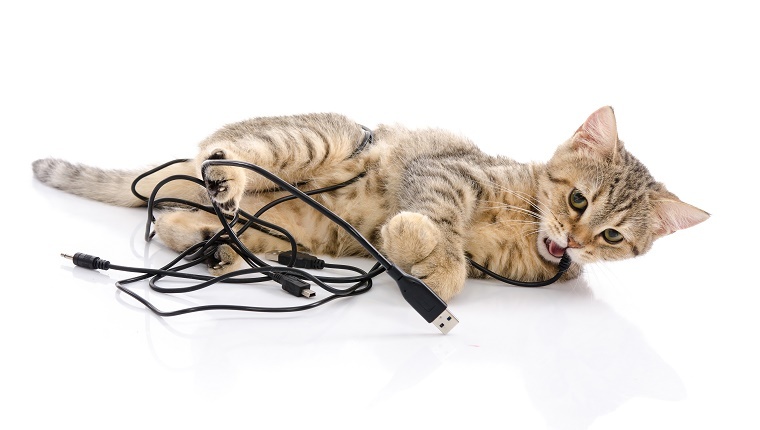 If your cat is chewing on plastic, be aware that electrical cords can present a risk, both for intestinal obstruction and electric shock. Rubber bands, food containers, and any other object that is easy to chew and tear apart may also present a choking hazard in addition to blockages in the digestive tract. Before you try anything to stop pica, take your cat to the veterinarian. You’ll need to work with your vet to rule out any medical causes that need to be addressed. Find out what your vet recommends to curb the chewing and eating. Here are some possible ways to reduce pica that you might want to discuss. Adjust the diet. Your vet may suggest that you alter the amount of fiber or fat in your cat’s diet. It is important that you do not change your cat’s diet without consulting your vet. Too much or too little fat and fiber in the diet can lead to a host of other conditions, including gastrointestinal problems. Mental and physical stimulation. A bored cat can be a destructive cat. Play with your kitty when you’re home and consider getting some puzzle toys for them while you’re out. Make sure your cat has a nice place by the window to watch birds or spy on people walking past. This will help ease boredom and provide some mental stimulation. Teach your cat a new trick or play a new game. Keep them busy and challenged, and you may see a reduction in anxious or destructive behavior. Reduce stress. Your cat may feel anxious about something and eat items to cope. 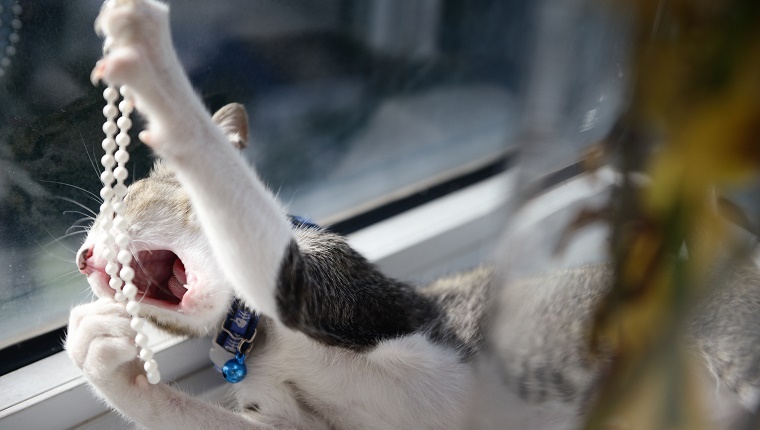 If you’ve moved recently and changed the cat’s environment, if you’ve added a new pet to the family, or if there is stress at home that your cat is picking up on, this may be the cause of your kitty’s anxiety. Provide your cat with lots of safe spaces, including enclosed areas like boxes, elevated perches so your kitty can keep an eye on their environment, and a secure litter box area. This will help your cat get adjusted to environmental changes. Remove items they like to chew. If your cat is chewing on items like clothing or blankets, put them in drawers or closets that will stay closed while you’re out. Keep dirty laundry in a hamper that can close tightly. Wrap up any electrical cords and put them away when you’re not using them. Lock up cabinets that your kitty can open. If you have houseplants, it may be time to find an outdoor space for them, or put them in a room that stays closed during the day. Make items less appealing. There are nontoxic cat deterrent sprays that can safely repel your cat from electrical cords or other objects that you can’t put away all the time. Substances with a strong smell or bad taste may also work, like citrus sprays or hot sauces. Provide safe alternatives. Give your cat some safe, chewable cat toys with treats inside or puzzle toys that will keep them busy. Instead of allowing your cat to nibble on grass or houseplants, try growing some catnip or a catnip alternative that your kitty can safely chew. Just make sure your cat isn’t eating the potting material. Consult a behaviorist. A professional can work with you, your vet, and your cat to address some of the problems and causes of pica. They can try a more personalized approach for your individual cat that you may not find elsewhere. If it keeps your cat safe and healthy, it’s worth it. There is no quick solution to the problem. It’s a behavior that will take time to work with. Be patient, as it won’t be fixed over night. It may take weeks, months, or even years to get to a point where your cat is no longer chewing nonfood objects, but keep at it.